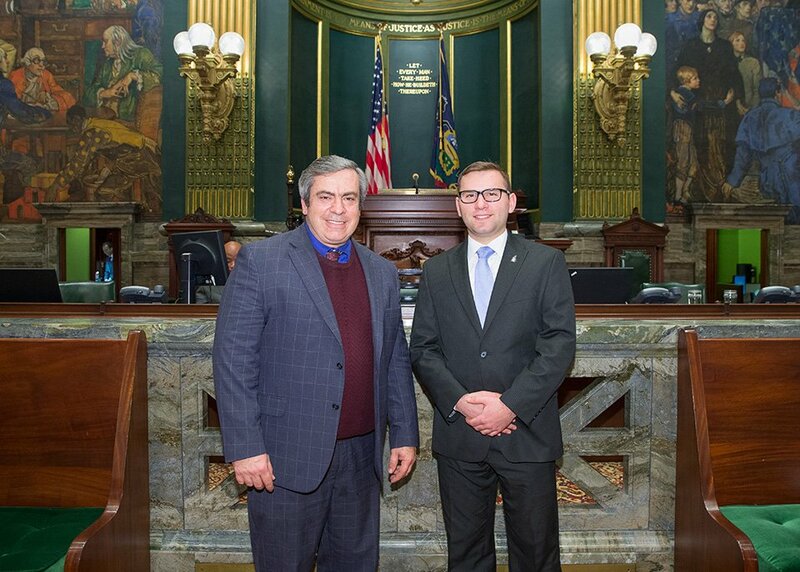 September 27, 2016 - Senator Browne (left) welcomed Hunter Kushy to the Senate Floor. 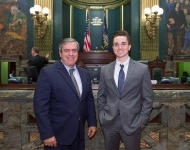 Hunter is interning in Senator Browne’s Allentown District Office. Hunter will receive his Associate degree in Business Administration from LCCC in December and will continue his education in the spring, seeking a degree in Finance. 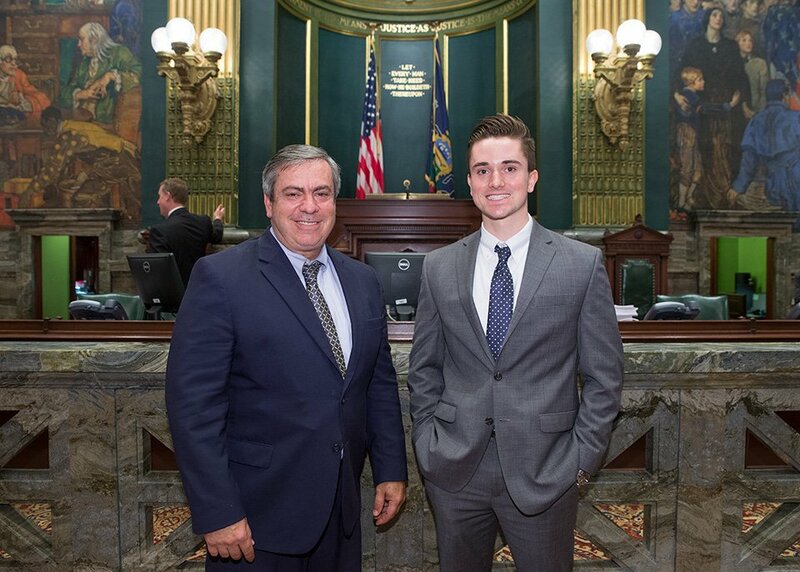 April 4, 2016 – Senator Browne (left) with Zach Letourneau (right), an intern his district office, on the Senate Floor. May 2, 2016 – Senator Browne speaks during a visit with students in Professor Stephen Roman’s Political Science class at Lehigh Carbon Community College. 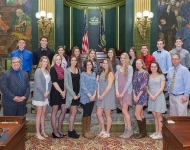 The theme of the introductory Political Science course is “The Power of Positive Politics.” Senator Browne discussed state government and the state budget during his visit. March 31, 2016 - Senator Browne (center) looks over a presentation from the Carbon-Lehigh Intermediate Unit #21 on its Pre-School Early Intervention program. Sitting next to Senator Browne are Rep. Peter Schweyer (left) and Dr. Elaine Eib (right), Executive Director of the Carbon-Lehigh Intermediate Unit #21. 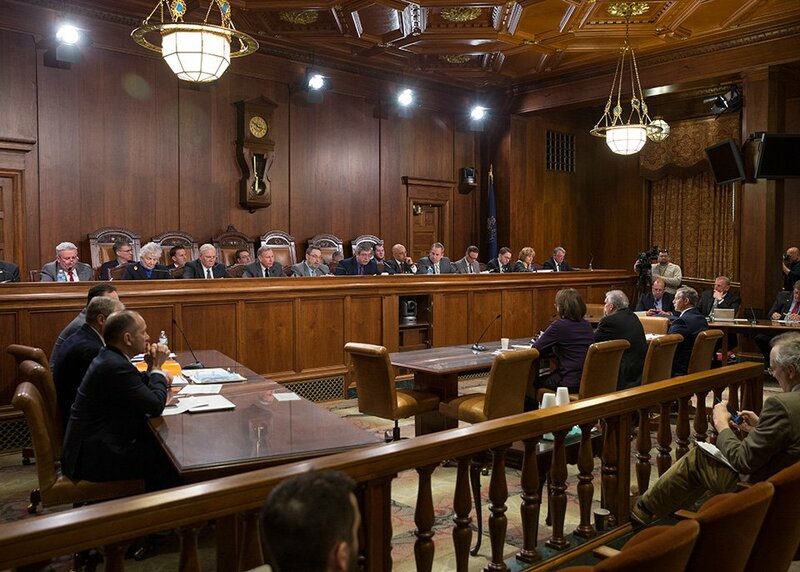 March 31, 2016 - Senator Browne (third from left) listens to a presentation given by Deborah Popson, Director of Special Programs and Services for Carbon-Lehigh Intermediate Unit #21, on the Pre-School Early Intervention program. 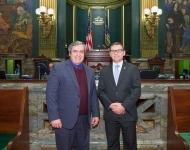 Senator Browne was joined at the legislative briefing by Representatives Peter Schweyer, Ryan Mackenzie and Mike Schlossberg, along with Mick Dee, Legislative Aide to Rep. Dan McNeill. 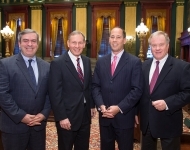 March 31, 2016 - Senator Browne (far right) along with (standing from left to right) Kim Talipan, Assistant to the Executive Director of the Carbon-Lehigh Intermediate Unit #21, Mick Dee, Legislative Aide to Representative Dan McNeill, and Dr. Elaine Eib, Executive Director of the Carbon-Lehigh Intermediate Unit #21, tour one of the Pre-School Early Intervention classrooms at Carbon-Lehigh Intermediate Unit #21. 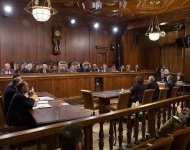 March 28, 2016 – Senator Browne (center) discusses Lehigh County’s Regional Intelligence (RIIC) and Investigation Center with (from left to right): Mark Grochocki, District Director for Senator John Yudichak, Lehigh County District Attorney Jim Martin, Roger MacLean, Chief Criminal Investigator at the Regional Intelligence and Investigation Center, Senator John Yudichak and Julia Kocis, Director of the Regional Intelligence and Investigation Center. 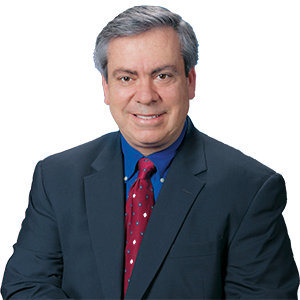 RIIC integrates police departments in the county and dozens of local, state and federal databases in one electronic crime-fighting resource. This data can then be analysis and shared in an effort to solve crimes. 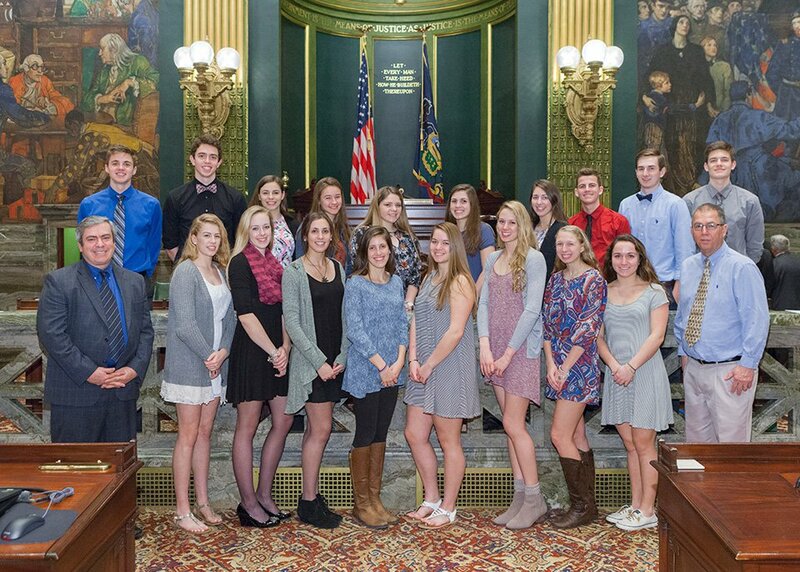 March 14, 2016 – Senator Browne (far left) welcomed the 2015 PIAA Class 3A State Champion Parkland High School girls volleyball team to the Senate Floor. 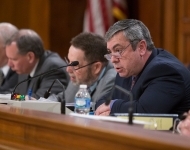 February 22, 2016 – Senator Browne (center) chairs the first day of Senate Appropriations Committee Budget Hearings. 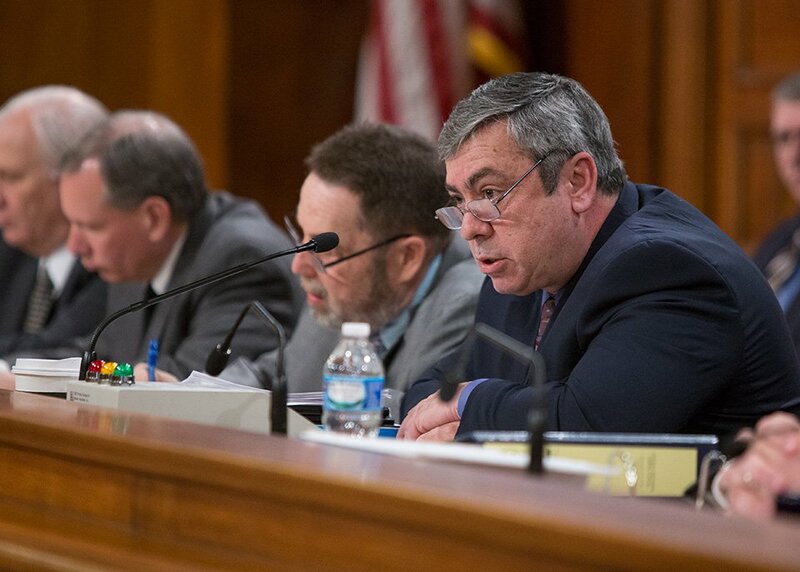 February, 22, 2016 – Senator Browne asks a question during the Senate Appropriations Committee Budget Hearing with the Governor’s Office of the Budget. 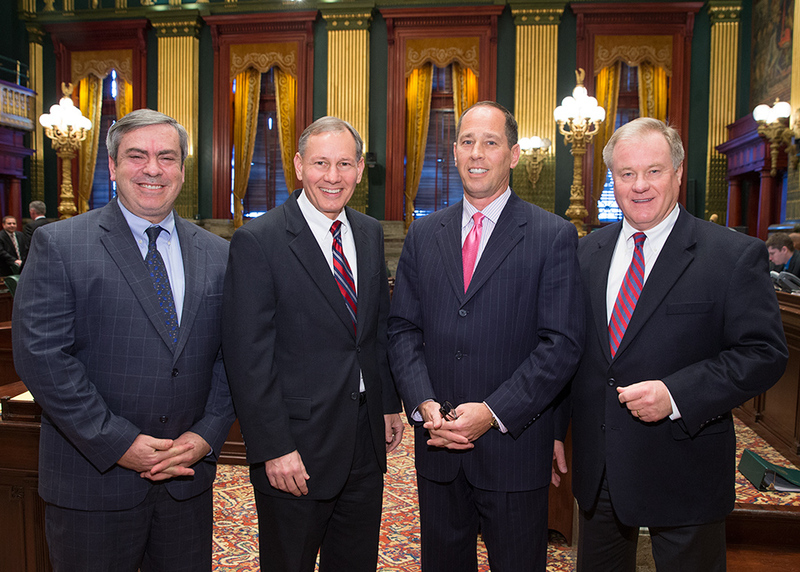 January 5, 2016 – Senator Browne (far left) with (from left to right) Senators John Eichelberger, Joe Scarnati and Scott Wagner following the re-election and swearing in of Senator Scarnati as President Pro Tempore of the Senate.